Offering you a complete choice of services which include conductivity testing service for non ferrous metals & alloys, radiography testing, magnetic particle test service, dye penetrant test service and ndt structural & building inspection services. Conductivity Meter works on the principle of Eddy Currents. It measures the electrical conductivity of non-ferrous metals in a range of 10% I.A.C.S (International Annealed Copper Standard) with an accuracy of ± 1% I.A.C.S. Narang Metallurgical & Spectro Services are pioneer & its proficiency with Conductivity testing measurement allows us to report results with utmost accuracy. Typical user industries which cater to our services are Switchgear, Busbar, Aviation, Railways, Cable & State Electricity Boards. 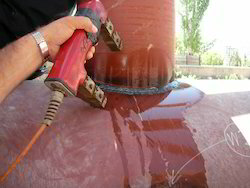 This is an expensive technique compared to the other nondestructive techniques and is predominantly used to detect internal flaws in casting and weldments. 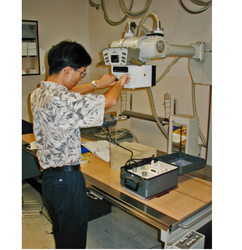 This technique involves the use of penetrating gamma or X-radiation to examine parts and products for imperfections. An X-ray machine or radioactive isotope is used as a source of radiation. Radiation is directed through a part and onto film or other media. The resulting shadowgraph shows the internal soundness of the part. Possible imperfections are indicated as density changes in the film in the same manner as an X-ray shows broken bones. Radiographic applications fall into two distinct categories evaluation of material properties and evaluation of manufacturing and assembly properties. Material property evaluation includes the determination of composition, density, uniformity, and cell or particle size. Manufacturing and assembly property evaluation is normally concerned with dimensions, flaws (voids, inclusions, and cracks), bond integrity (welds, brazes, etc. ), and verification of proper assembly of component pieces. Magnetic particle Inspection/Test (MPI) is a non-destructive testing (NDT) process for detecting surface and subsurface discontinuities in ferrous materials. The process puts a magnetic field into the part. The piece can be magnetized by direct or indirect magnetization. Direct magnetization occurs when the electrical current is passed through the test object and a magnetic field is formed in the material. Indirect magnetization occurs when no electrical current is passed through the test object, but a magnetic field is applied from an outside source. The magnetic lines of force are perpendicular to the direction of the electrical current which may be either alternating current (AC) or some form of direct current (DC) (rectified AC). The presence of a surface or subsurface discontinuity in the material allows the magnetic flux to leak. Ferrous iron particles are applied to the part. The particles may be dry or in a wet suspension. If an area of flux leakage is present the particles will be attracted to this area. The particles will build up at the area of leakage and form what is known as an indication. The indication can then be evaluated to determine what it is, what may have caused it, and what action should be taken if any. Liquid penetrant testing is a non-destructive method used to detect surface breaking defects in any nonporous material. 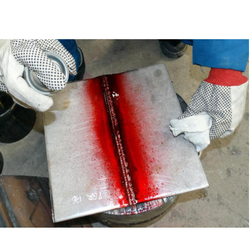 Liquid penetrant is applied to the surface and is drawn into defects by capillary action. Once a preset dwell time has passed, excess penetrant is removed and developer applied to draw out penetrant from defects. Visual inspection is then performed. Visible and Fluorescent Liquid Penetrant Examinations are Non-Destructive methods of revealing discontinuities that are open to the surfaces of solid and essentially non-porous materials, ferrous or non-ferrous. 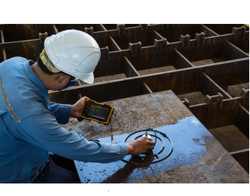 We are a widely recognized service provider for the accurate NDT Servicesand structural & building inspection. Our in-house lab is well equipped with different sophisticated testing machines and equipment, which enable us to offer the reliable, accurate and precise inspection services. We are authorized to conduct these tests by the Govt. of India, due to our exact results. by Our team of expert professionals render these inspection services, as per the specifications and demands of our clients. Looking for NDT, Structural & Building Inspection ?